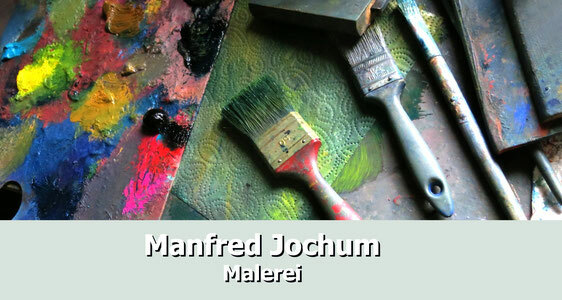 On my Paintings - jochum-arts Webseite! I see myself as artist in the field of "abstract expressionism". I have been painting for many years, using oil colour, acrylic, pastel, crayon, collages. Another work area are objects and sculptures, mainly painted wooden objects. I also love photography and work a lot in this area, too, using digital but also old "historical" analogue cameras, of which I have quite a collection. For quite some time I painted in the concrete way of painting. Main areas were: Groups of figures, cities, still life. From there I was more and more moving towards abstract painting: bulky static vertical figures, nearly filling the picture, square figures in strong colouring, natural forms transformed into geometrical figures. Edged heads are recognisable, like masks, strange and sometimes frightening. Animals, plants, buildings. In my paintings I express myself free from any constraints. The painting aspects prevail, whereas drawing appears less important. I want to create tension through colour, lines and space, to transform rhythmic elements and music into movement or into rather static forms. For me painting is not different from music, the purest form of abstract art. The style elements of both forms of art correspond in an amazing way: keys and chords (warm and cold colours), consonance and desired dissonance, length and volume of tones, tone lines, legato or staccato, tempi, short sequences of tones (strong rhythmical paintings) - one could keep on looking for such parallels, which appear to be obvious. Hence, it is hardly conceivable for me that sometimes even highly intelligent and educated people, when looking at a painting, immediately seek to recognise "what it is supposed to represent", and become totally unhappy and negative if they don't succeed in finding this out - on the other hand, when listening to one of Johann Sebastian Bach's suites for solo violin or to a piano sonata by Wolfgang Amadeus Mozart it would never come to their minds to ask: "What is this supposed to mean?" Quite obviously we are all used to listening to abstract works but not to watch abstract works. I paint spontaneously and fast. For me this an important prerequisite of the "freedom in painting" However, painting spontaneously does not mean that I finish a painting quickly. By constant over-painting of the whole or of parts of the painting, thus retaining parts of the previous version, a painting is developping, so that moods, thoughts and feelings of quite different periods of time sort of mix into a "mood collage". This way of painting and over-painting also reflects the circle of life: Constantly destroying and rebuilding something new. It also has something "endless" - it is hard to determine when a painting is "ready". Sometimes a painting takes three days, others three years. By painting this way, the colours often change during the painting's "lifetime". The final version is often dominated by shades of blue and green, even though I did not intend that. Blue is the colour of the silence, well balanced, but also the colour of the unreal, of dreams, illusions and deceptions. But blue, as any other colour, demands the contrast. Without strong contrast colours like aggressive vermilion, magenta, lemon yellow or ochre it would hardly be possible to build up tension. It is not my objective to show concrete objects. The great painter Franz Marc, when once reproached with the argument that his painted horses didn't look like horses at all, replied: "They are no horses, they are images". With this great answer he perfectly expressed what painting is about. I don't paint persons, animals, flowers, landscapes, I paint images. My aim is to express present spontaneous ideas and feelings and to work on impressions, to paint what you don't see, what is inside me, reflections of personal experience. Just like a dream, which surfaces such experience and feelings in an often bizarre mix of numerous elements. My painting do not address the "head" of the person who looks at them. They are not supposed to be intellectually analyzed. My wish is that they are simply enjoyed, like the miracle world of music, like a Mozart piano sonata or a Bach fugue, without questioning what the composer - or painter - might have had in mind when creating the piece of art. They are supposed to be received purely emotionally, accepted or not accepted. Even the non-acceptation, the rejection of a painting, sets free and provokes feelings, thus automatically leading to an emotional "dialogue" with the painting. The viewer should not attempt to reconstruct the artist's feelings or intentions -- it would be impossible anyway. Clearly, there is no "right" or "wrong" emotional interpretation. Each observer as an individual introduces his own feelings and gets them mirrored by the painting - so the painting serves as a "projection screen" for his own perceptions. These can be fury or sadness, joy, well-being, pleasure, jealousy - everything that affects human beings. Hence, each individual interpretation of a painting is always "right", if seen from the observer's point of view. Thank you for having read my considerations to my paintings.